Green is the new black. Or is it the new pink? Either way, it is a popular topic, because according to 15 000 scientists from 184 countries around the world who signed a ‘warning to humanity’ last week, life as we know it depends on it. And that is hard to ignore. But if you’re a start – up, we’re here to tell you that it’s not all doom and gloom. Being a ‘Green’ start- up not only discharges your duty as a sensible citizen of planet earth, but it has financial benefits too. Not only is it important that your business follows sustainable practices, but if your start-up idea offers environmentally friendly products or services, even better. Consumers are much more selective of who they deal with and are increasingly looking for sustainable alternatives in the areas of construction, beauty, recycling, retail and service. Sell eco-friendly toys: Landfills worldwide are overflowing with cheap drive-through meal toys and discerning parents are taking notice. Toys that are durable will easily decompose or toys made from recyclable materials are gaining popularity and the options are no longer limited to wooden blocks and trains. Use your imagination and the sky is the limit. Sell environmentally friendly building materials: The trend towards environmentally friendly building materials such as solar geysers and energy-saving materials is booming. Staying, ahead of worldwide trends will give you the edge in this industry. Start a Green Event organising business: All eyes are on exhibition and event organisers to organise sustainable events. From the venue choice, to catering, to waste management and recycling. Find out more about how to arrange a sustainable event, from the Event Greening Forum at www.eventgreening.co.za. Start a car-sharing service: Car-sharing is another way of reducing carbon emissions and curbing global warming. You will need to find a way to monitor, introduce customers to each other and collect commission. An App would be a perfect vehicle for such a venture. Start an environmental magazine, radio or TV program: If you are passionate about the environment, you do enough research to offer useful, quality content and you have contacts in the media, this could be an ideal and lucrative option for you. Even if your start-up idea is not necessarily eco-friendly, there are other ways you can contribute. 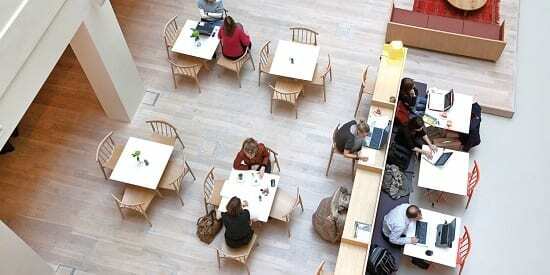 Sustainability is one of the founding principles of the co-working movement. Sharing resources like printers, PC’s, furniture and infrastructure translates to saving the planet and saving you money. A win-win situation! Many co-working spaces are now also implementing environmentally friendly measures such as LED lighting, drought-resistant plants, reusable cutlery and crockery and non-toxic paints. Allowing employees to work from home reduces carbon emissions, but also saves you money in other areas. Studies have shown that employees and prospective employees are willing to take a cut in salary in exchange for flexible work options. That, coupled with increased productivity and other benefits such as savings on infrastructure, will save you money. A word of caution: Research the flexible work options relevant to your team and remember that one size doesn’t always fit all. As the saying goes, “Start as you mean to go on”. If you build sustainable measures into your start-up from the outset, it will be much easier to stick to. In turn, you will start saving money (and the earth) when it matters most. Spaces – Atrium on 5th in Sandton (previously Sandton Twin Towers) is opening soon. Having undergone major refurbishment, the building is cloaked in a revolutionary high-performance double-glazed frontage to lend a modern feel and increase floor-space. Most notable, is the building’s sustainable and energy-efficient initiatives, with developer Aurecon being awarded the ‘Best Quality Submission’ by the Green Building Council SA (GBCSA) in September 2014 for the project. An impressive green wall in the atrium houses a unique crate system made from recycled material – the perfect co-working space for start – ups who want to benefit their pockets while reducing their effect on the planet.